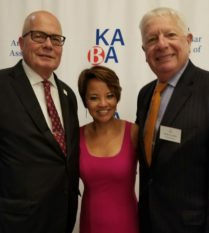 Sonni Choi Williams (’99) is pictured with ISBA President Judge Jim McCluskey (’79, left) and ISBA President Elect David Sosin. Sonni Choi Williams (‘99) was installed as a board member of the Korean American Bar Association Installation on Friday, September 21, 2018. KABA of Chicago was first established in 1993 and now has over 400 members consisting of partners and associates from law firms of all sizes, solo practitioners, in-house counsel, judges, and law students. For the past two decades, KABA has promoted the professional growth of Korean-American lawyers and law students in the Chicago area, fostered the exchange of ideas and information between its members, the legal profession, the judiciary, and the community, and encouraged cooperation with other bar associations and community organizations on matters of common concern.